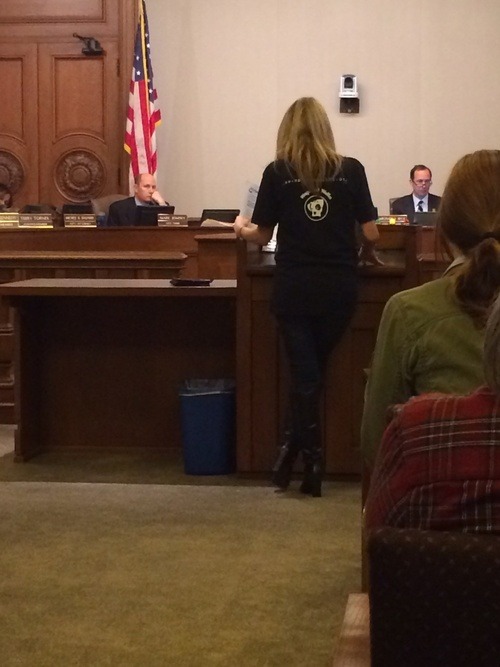 On Monday, January 27th Wags & Walks rescue joined over 100 pit bull advocates at the City Council Meeting in Pasadena to oppose Councilman Steve Madison’s proposed mandatory spay/neuter ordinance for all pit bull or pit bull cross breeds in the city of Pasadena. This meeting proved to be both extremely upsetting and extremely inspirational. Madison serves on the Pasadena city council and has continued to speak out against pit bulls stating that they are an inherently dangerous breed and has defended his beliefs by comparing pit bulls to “fully automatic machine guns.” Because the state of California does not allow for state or city bans on specific breeds, Madison has clung to the only breed specific ordinance currently allowed under state law, the option to require certain breeds to be spayed or neutered. At the meeting Monday night, Madison claimed his proposal was in fact an effort to help reduce the number of euthanized pit bulls in the city, yet he could not contain his hatred of this breed and continued to quote unsubstantiated information he has found on pit bull hate websites. Through the efforts of Josh Liddy and his local pit bull advocacy organization SwayLove.org with over 11,000 followers, word spread about Madison and his ill-conceived plan. Pasadena residents, people from surrounding communities as well as state pit bull advocacy organizations like Pit Bulls Against Misinformation from Sacramento congregated to stand up for pit bulls and to speak out against Steve Madison’s ignorant propaganda. Despite the council meeting starting nearly an hour late and this proposal not coming up for discussion until nearly 10 PM, 58 people stayed to take the podium and speak passionately about this breed and how misguided Madison’s claims are. All of these speakers showed great passion and utilized hard data as well as personal experiences in an effort to reach Steve Madison, as well as his fellow council members. Unfortunately, true to self, Madison ignored most of these speeches or laughed inappropriately when people gave examples of how pit bulls had made positive impacts on their lives or when an example was given of how resilient and forgiving pit bulls rescued from dog fighting rings are. Though this proposal was tabled until July 14th when the council members will review an alternative proposal that would require all dog breeds to be spayed or neutered in Pasadena in addition to this proposal and though Steve Madison did not waiver from his soap box or give the pit bull community his attention or respect, a lot of good did come out of this night. Pit bull owners, advocates, members of the rescue community, AKC representatives and many others came together to stand up for an incredible and incredibly misunderstood breed. We filled the main room to standing room only as well as two additional over flow rooms to stand up for what we believe in and stayed until after midnight on a Monday night to show Madison that we will be heard and we will not back down. Not one person came to speak in support of his proposal. We were also given great respect from many of the other council members present that night including Councilman John Kennedy who gave his full attention all night, taking notes on many of the points made in our speeches and who made the only real effort to vote down this proposal that night. In his efforts to demonize pit bulls and to create breed specific legislation in his community, Councilman Steve Madison in fact helped further unite the pit bull community in LA County while further segregating himself from the rest of his council members. Wags & Walks was happy to have been a part of such an amazing group of people and we will continue to stand up for a breed that many of us in the rescue choose to have as our own personal pets.